The scholarly debate on deliberative democracy often suggests that participatory processes will contribute to make environmental governance not only more legitimate and effective, but also lead to the empowerment of marginalized social groups. Critical studies, however, analyse how technologies of governance make use of participation to draw boundaries that separate technical knowledge from political concerns, direct the focus towards procedural aspects and contractual obligations, and reinforce hegemonic understandings of development and of local people’s relationships to their environment. 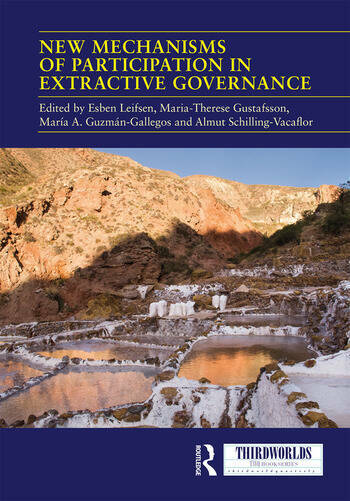 This book focuses on the dynamics and use of participatory mechanisms related to the rapid expansion of the extractive industries worldwide and the ways it increasingly affects sensitive natural environments populated by indigenous and other marginalized populations. Nine empirically grounded case studies analyse a range of participatory practices ranging from state-led and corporation-led processes like prior consultation and Free Prior and Informed Consent (FPIC), compensation practices, participatory planning exercises and the participation in environmental impact assessments (EIAs), to community-led consultations, community-based FPIC and EIA processes and struggles for community-based governance of natural resource uses. The book provides new insights through a combination of different theoretical strands, which help to scrutinize the limits to deliberation and empowerment on the one hand, and on the other hand to understand the political resistance potential that alternative uses of participatory mechanisms can generate. The chapters originally published as a special issue of Third World Quarterly. Esben Leifsen is an Associate Professor at the Department of International Environment and Development Studies, the Norwegian University of Life Sciences, Norway. He teaches anthropology and politics of international development, and carries out research within the fields of the anthropology and political ecology of resource extraction, socio-environmental conflict, environmental justice and indigenous rights. Maria-Therese Gustafsson is a Postdoctoral Research Fellow at the Department of Political Science, Stockholm University, Sweden. Prominent themes in her research are private politics, political participation, natural resource governance and climate security. Her dissertation was awarded with the prize for the best dissertation at the Faculty of Social Science, Stockholm University, in 2015. María A. Guzmán-Gallegos is a Postdoctoral Research Fellow at the Department of Social Anthropology, University of Oslo, Norway. Her research foci include personhood and gender, Amerindian conceptualizations of nature and society, and socio-environmental conflict related to extraction. Current research interests are environmental governance, contamination and Amerindian conceptualizations of human and non-human bodies. Almut Schilling-Vacaflor is a sociologist and anthropologist who is currently a Postdoctoral Research Fellow at the University of Osnabrück, Germany. Her research deals with environmental governance, socio-environmental conflicts, participation, contention and rights. Schilling-Vacaflor headed a research project on "Consultation, Participation and Conflict Transformation", funded by the German Foundation for Peace Research.